The Astros have inked free-agent righty Hector Rondon to a two-year, $8.5MM pact. Rondon, an Octagon client, was non-tendered by the Cubs earlier this month. Now, he’s lined up for successive $4MM and $4.5MM salaries in Houston, where he’ll represent an arm with closing experience to help fortify the back of the bullpen. Rondon, 30 in February, saved 77 games with a 2.44 ERA, 9.3 K/9 and 1.9 BB/9 with the Cubs fro 2014-16. He initially lost the closer’s role in Chicago through little fault of his own, as he was bumped from that spot when Chicago acquired Aroldis Chapman from the Yankees prior to the 2016 non-waiver trade deadline. The 2017 season was Rondon’s worst since the 2013 campaign (when he was a Rule 5 pick out of the Indians organization), as he turned in a 4.24 ERA with a 3.1 BB/9 mark — both his highest levels since that rookie season. However, Rondon also logged a career-high 10.8 K/9 and 29.1 percent overall strikeout rate in 2017 while maintaining excellent fastball velocity (average of 96.4 mph) and an above-average ground-ball rate (48.3 percent). Like many pitchers throughout the league, Rondon has become increasingly susceptible to home runs across the past two seasons, averaging 1.5 HR/9 despite being extremely stingy in that regard throughout the first three seasons of his career. His increased vulnerability to the long ball obviously made the uptick in walks this past season all the more damning, though metrics like xFIP (3.43) and SIERA (3.20) remained generally bullish on his abilities. Houston has already reportedly added to its supply of late-inning arms by striking a deal for sidearm righty Joe Smith, and Rondon will give them another option to pair with the likes of Ken Giles, Chris Devenski and Will Harris in the late innings. Giles, who served as the team’s closer throughout the season, struggled in the playoffs, though the addition of Rondon wouldn’t seem to supplant him from that ninth-inning role. If Giles’ struggles carry over into the 2018 campaign, though, Rondon would certainly be a plausible alternative for manager A.J. Hinch to get the final few outs of a game, given his extensive experience in Chicago. Ken Rosenthal of The Athletic reported the signing on Twitter. Rosenthal (in a tweet), SB Nation’s Chris Cotillo (via Twitter), and Jon Heyman of Fan Rag (via Twitter) had contract details. A variety of organizations are still looking at versatile infielder Eduardo Nunez. Jon Heyman of FanRag tweets that the Red Sox, Blue Jays, and “possibly” the Yankees are among the suitors. Boston president of baseball operations Dave Dombrowski acknowledged the interest, as Alex Speier of the Boston Globe was among those to tweet. The Giants have some ongoing involvement, too, but Andrew Baggarly of The Athletic reports (via Twitter) that San Francisco is “a longshot” to make a deal. In addition to a host of other teams, the Astros have some interest in outfielder Carlos Gonzalez, according to Heyman (Twitter links). The Blue Jays, meanwhile, have checked in not only on Gonzalez but also fellow free agent oufielder Carlos Gomez. The Nationals are interested in reliever Hector Rondon, Jorge Castillo of the Washington Post tweets. Washington isn’t the favorite to land Rondon, according to Castillo, though he does note that the former Cub is familiar with manager Dave Martinez and bullpen coach Henry Blanco. Both men were on Chicago’s staff through last season. The Rangers and Red Sox each have some degree of interest in free agent first baseman Mark Reynolds, SB Nation’s Chris Cotillo tweets. They join a few other clubs with interest, as we covered recently. The Orioles have made offers to several free agent pitchers, per Brittany Ghiroli of MLB.com. It’s unclear whether longtime Oriole Chris Tillman is among that group, but the team did make an unsuccessful bid to re-sign him toward the end of last season, Ghiroli reports (Twitter link). With a pair of relief signings being wrapped up, the Phillies seem to feel good about that aspect of their roster. Per MLB.com’s Todd Zolecki, via Twitter, the team will turn its gaze to improving the rotation. Both they and the Yankees checked in with the Diamondbacks regarding right-hander Zack Greinke, Robert Murray of FanRag writes. Greinke ending up with either club is unlikely, however, sources informed Murray. With the Rangers also having shown interest in Greinke, we now know at least three teams have inquired about the expensive 34-year-old this offseason. Greinke is the latest hurler to land on the radar of the Yankees, who have also eyed Pirates righty Gerrit Cole. Consequently, the Bucs “are gathering names of young, controllable” Yankees they could acquire in a Cole deal, though there’s “nothing close,” Bill Brink of the Pittsburgh Post-Gazette reports (on Twitter). Notably, Brink adds that the Yankees are also “looking at” Rays righty Chris Archer. The 29-year-old has drawn significant interest this winter, but it’s unclear whether the Rays will move him. The Royals are giving serious consideration to dealing southpaw Danny Duffy, who’s “extremely popular” on the trade market, Jon Heyman of FanRag tweets. Duffy suggested on Twitter that he doesn’t want to go anywhere, for what it’s worth. “Bury me a Royal,” he declared. As the Blue Jays look for pitching reinforcements, they are giving real consideration to veteran CC Sabathia, as Ben Nicholson-Smith of Sportsnet.ca writes. Though manager John Gibbons suggested his own priority is to add bats, he also said he’d welcome the addition of the veteran Sabathia — who has a lengthy history with the Jays’ current front office leadership stemming from their time in Cleveland together. Teams have given up on trying to acquire Reds closer Raisel Iglesias, Heyman reports on Twitter. The Reds understandably want an enormous haul back for the 27-year-old star, who’s under affordable control for the foreseeable future. The Twins and Rays have chatted about veteran righty Jake Odorizzi, per Mike Berardino of the St. Paul Pioneer-Press (via Twitter), who adds that Tampa Bay was not interested in Minnesota’s initial offer. Although they’re at the beginning of a full, cost-cutting rebuild, the Marlins aren’t feeling any urgency to deal righty Dan Straily, per Joe Frisaro of MLB.com (Twitter link). Miami’s de facto ace will play his first of three arbitration-eligible seasons in 2018. He’s projected to earn a $4.6MM salary, which even the Marlins can afford. The Mets are not likely to sign another free agent reliever, at least in the near term, according to GM Sandy Alderson and as MLB.com’s Anthony DiComo tweets. Instead, after landing Anthony Swarzak, the organization expects to begin looking to fill its other needs. Before the Astros agreed to a deal with Joe Smith on Wednesday, Brian McTaggart of MLB.com hinted on Twitter that the team could have interest in free agent righty Hector Rondon. Whether that still stands remains to be seen, but the Astros are already chock-full of righty relievers as it is. The open market welcomed 26 additional free agents Friday when various major league teams chose not to tender contracts to certain arbitration-eligible players. While no one is going to confuse the new members of this winter’s unsigned class with any of the top free agents, there are at least a few who could boost teams’ chances in 2018 and beyond. As Tyler Flowers, Steve Cishek and Welington Castillo have shown over the past couple years, a non-tender doesn’t have to be a career death knell. Hector Rondon, RP: The hard-throwing, right-handed Rondon isn’t that far removed from a two-year showing in which he was among baseball’s premier relievers. The former closer pitched to a minuscule 2.03 ERA with 8.91 K/9, 2.03 BB/9 and a 50.8 percent groundball rate across 133 1/3 innings from 2014-15, during which he combined for 59 saves on 68 attempts. 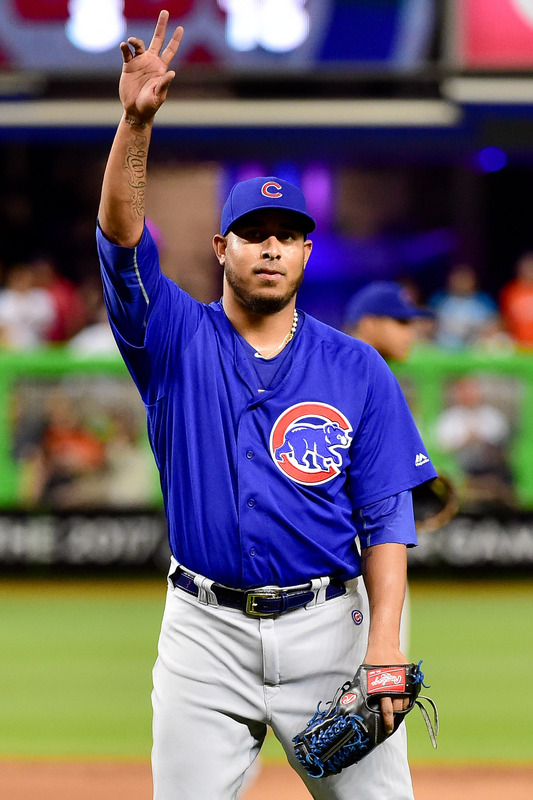 However, Rondon’s effectiveness began fading during the Cubs’ World Series-winning 2016 campaign – thanks in part to an arm injury, perhaps – and he’s now fresh off a year in which he posted a 4.24 ERA. But Rondon managed at least 50 innings (57, to be exact) for the fourth straight season in 2017, when he also continued his groundballing ways (48.3 percent) and logged a career-high swinging-strike rate (11.3 percent). Further, even during his disappointing 2016-17 stretch, he saw his K/9 rise to an impressive 10.55 (against 2.33 walks per nine). While neither the Cubs nor any other team thought Rondon would be worth a projected $6.2MM in 2018, the 29-year-old still figures to intrigue a host of clubs – some of which may not be in the mood to pay high prices for established relievers this winter. Mike Fiers, RHP: An estimated $5.7MM for Fiers was too rich for the Astros and other teams, but it wouldn’t have been an unreasonable amount relative to what the 32-year-old has done during his career. Since debuting as a starter with the Brewers in 2012, Fiers has racked up 694 1/3 innings from the rotation and compiled a respectable 4.15 ERA, also notching 8.64 K/9 against 2.79 BB/9. Fiers was one of the few members of the World Series champion Astros who endured a miserable 2017 (5.22 ERA, 5.43 FIP in 153 1/3 frames), but if the personal-worst 19.5 percent home run-to-fly ball rate he put up more closely resembles his career mark of 13.6 going forward, he could return to being a decent innings eater. Matt Adams, 1B: Lefty-swinging first basemen who struggle against same-handed pitchers aren’t exactly rare, so it wasn’t that surprising when the Braves jettisoned Adams in lieu of potentially paying him around $4.6MM in 2018. That said, Adams has been quite useful versus right-handed pitchers, having slashed .286/.333/.495 against them in 1,510 plate appearances, and has typically been adept at first base (14 Defensive Runs Saved, 8.3 Ultimate Zone Rating). Those skills should make the 29-year-old Adams a worthwhile pickup for someone, though he’s a small fish in a big free agent pond that includes other proven first base types in Eric Hosmer, Carlos Santana, Logan Morrison, Yonder Alonso and Adam Lind. Jared Hughes, RP: As a groundball specialist who has generated excellent results despite a dearth of strikeouts, Hughes isn’t all that dissimilar to more hyped free agent Brandon Kintzler. But even though he has a good track record and was projected to earn a very reasonable $2.2MM in 2018, the 32-year-old Hughes is now on the unemployment line. Based on Hughes’ history, Milwaukee’s loss could be a big gain for another club. Since 2014, his first of four consecutive solid years, the ex-Pirates righty has thrown no fewer than 59 1/3 innings in any individual season and ridden a 62.1 percent grounder rate to a 2.55 ERA. Hughes ranks eighth among qualified relievers in GB rate and 18th in ERA over the past four seasons, despite having registered only 5.54 K/9 against 3.02 BB/9 during that span (notably, though, his K/9 rose to a career-high 7.24 in 2017). Drew Smyly, LHP: With his estimated $6.85MM salary, Smyly was a non-tender waiting to happen the moment he underwent Tommy John surgery in June, officially ending a season in which he was unable to take the mound for Seattle. The Mariners acquired Smyly 10 months ago with the hope that he’d serve as a capable mid-rotation starter – something he had been at times with the Rays from 2014-16. Smyly combined for 395 innings of 3.94 ERA ball during those seasons and recorded 8.59 K/9 against 2.53 BB/9, and offset a paltry grounder rate (34.2 percent) with a league-best infield fly mark (15.3 percent). It’s anyone’s guess whether Smyly will resemble his old form when he returns (perhaps not until 2019), but he’s still just 28 and looks worthy of taking a flyer on at an affordable cost this offseason. The Cubs will not tender a contract to reliever Hector Rondon, according to ESPN.com’s Jesse Rogers (via Twitter). MLBTR had projected Rondon to earn $6.2MM via arbitration — a price that was too high for Chicago and, evidently, other teams around the league. Rondon, 29, made quite an impact as a former Rule 5 pick, turning in a quality three-year run for the organization between 2014 and 2016. Over 184 1/3 innings in that span, he turned in a 2.44 ERA with 9.3 K/9 and 1.9 BB/9. Though he ceded his closer role to Aroldis Chapman in the midst of the team’s World Series run, Rondon remained a major piece of the club’s late-inning mix. That did not hold up in 2017, however, as Rondon ended the year with a 4.24 ERA in 57 1/3 frames. He struck out 10.8 batters per nine but also issued 3.1 free passes per nine innings and allowed ten long balls. Rondon did still deliver his average fastball in the 96 to 97 mph range, and turned in a personal-best 11.9% swinging-strike rate to go with a 48.3% groundball rate. Rondon seemingly lost the confidence of skipper Joe Maddon, to the point that he did not factor in the late-inning mix during the team’s postseason run. While the Cubs’ decision to move on is not terribly surprising at this point, it’s a bit of a surprise to learn that the organization was not able to find a suitable trade partner. The one-year price tag is hardly cheap, but falls in the range of contracts that often go to somewhat less-accomplished pitchers. There’s plenty of reason to think that Rondon will catch on elsewhere, perhaps even earning consideration for high-leverage innings, but it seems he’ll need to settle for less money than the $6.2MM or so he might have expected through arbitration. Red Sox skipper John Farrell says that DH/first baseman Hanley Ramirez underwent an MRI on his left biceps, as Pete Abraham of the Boston Globe tweets. A diagnosis and anticipated course of treatment aren’t yet available, but Abraham suggests the team is anticipating some absence from the veteran. The 33-year-old Ramirez has fallen off at the plate this year, slashing just .238/.320/.423 over his 522 plate appearances, with a shoulder problem seemingly bothering him throughout. The club surely hoped for a turnaround for the long-time slugger, but now there’s increasing uncertainty with this new injury. Cubs righty Hector Rondon is in need of some rest but doesn’t have anything more than a sore elbow, Bruce Levine of 670thescore.com tweets. He’s expected to miss about a week after getting a cortisone shot. Rondon has scuffled a bit this year, working to a 4.50 ERA in his 54 frames, due in no small part to coughing up ten long balls. That said, Rondon has also managed 10.8 K/9 against 3.3 BB/9 and remains an important part of the Cubs pen down the stretch and (the team hopes) into the postseason. As the Nationals continue to consider their options for the postseason roster, young outfielder Victor Robles is receiving real consideration, manager Dusty Baker tells reporters including Jorge Castillo of the Washington Post (Twitter link). The 20-year-old was something of an unexpected call-up, but is off to a hot start … in just ten plate appearances. There’s a long way to go until the Nats will feel comfortable entrusting a significant role to him when the stakes are highest, but it’s interesting to see that there’s real internal consideration given the team’s rather lengthy list of possible bench pieces. One major factor, of course, will be whether Bryce Harper can make it back; recent indications are that the team is cautiously optimistic. There’s little more than an “outside” shot for Brewers outfielder Lewis Brinson to make it back to health in time to impact the current season, per GM David Stearns (via Tom Haudricourt of the Milwaukee Journal-Sentinel, on Twitter). He has been down with a hamstring strain. The 23-year-old struggled upon reaching the majors for the first time this year, but had put up a monster season at Triple-A — where he batted .331/.400/.562 across 340 plate appearances. Brinson will surely be a big part of Milwaukee’s plans next year even if he can’t make it back on the field in 2017. The Cubs have already added Wade Davis and Brian Duensing to their bullpen, but they’re still trying to add depth, Gordon Wittenmyer of the Chicago Sun-Times writes. Ideally, they’d like to add another lefty, and they’ve been in touch with Travis Wood about returning. But Wood’s agent, Darek Braunecker, says his client has attracted interest from seven NL teams, as ESPN’s Jesse Rogers noted today. Those clubs value Wood’s versatility and hitting ability (Wood has a career .182/.208/.314 line, strong for a pitcher), and Wood would also like another shot at starting, a chance he’s unlikely to get with the Cubs. So a return to Chicago is far from a certainty. Another possibility for a left-handed addition to the Cubs’ bullpen is Jerry Blevins, who posted a 2.79 ERA, 11.1 K/9 and 3.2 BB/9 in 42 innings in a specialist role for the Mets last season, Wittenmyer writes. And the Cubs remain interested in righty Greg Holland, the former Royals closer who’s returning from Tommy John surgery and should be fully healthy for Spring Training. The team could also consider adding a bullpen piece in tomorrow’s Rule 5 Draft. In the meantime, the Cubs’ addition of Davis will bump Hector Rondon back into a setup role, even though Rondon has had success as a closer in parts of each of the last three seasons. Manager Joe Maddon, though, says Rondon understands the move.